This article, in Galician language, addresses the history of rural neiborghood in the bounds of the city of A Corunha and how it has suffered from different megaprojects that threaten its mere existence. The article refrences a arquitect project led by Ergosfera, a group of architets and how they claim a greater attention to heritage beyond the “academic” concept in order to incorporate those things that really makes the difference in a given city. “O grupo de arquitectos e arquitectas Ergosfera levaron a cabo unha investigación –Cousa de Elviña– sobre as orixes, o presente e o futuro do conflito entre os habitantes de Elviña e os desenvolvementos urbanísticos da cidade, tomando como base estas dúas vivendas e a súa contorna (A Pereiroa). O proxecto foi realizado no marco do programa Expontáneas da Concellaría de Cultura da Coruña, e é tamén unha exposición que xa se puido ver a semana pasada na sede do Concello, que está actualmente no local da Concellaría de Rexeneración Urbana e Dereito á Vivenda (no barrio de Montealto), e que entre o 18 e o 22 de xullo estará na sede coruñesa do Ministerio de Fomento. government polices are an affront to the community’s historic way of life; and 4) Adaptation, as the core problems are eventually identified and planning/mitigation strategies are developed. Residents become solidified in their beliefs; however, they begin to accept the reality of the situation at hand. Residents and officials feel a sense of progress. “The allegued Bilbao Miracle and Its Discontents” by Gerardo del Cerro Santamaría (The Cooper Union) and part of the book: Megaprojects: A Worldwide View (Research in Urban Sociology, Volume 13) Emerald Group Publishing Limited, pp.27 – 59. This chapter outlines and explains the development of the Abandoibarra megaproject, focusing in particular on the key role of the Bilbao Ría 2000 – an innovative cross institution, public–private partnership, responsible for coordinating the transfer of land between public and private agents. The chapter critically assesses the impact of the Guggenheim Museum Bilbao, the centerpiece in the Abandoibarra scheme. The narrative is based on fieldwork conducted by the author in the city of Bilbao. The chapter utilizes scholarly research, official sources, and reports in the news media to support the arguments. The chapter questions the viability of revitalization schemes based on urban megaprojects. Applying some of the elements in the revitalization mix to most cities may be unavoidable due to rapid and acritical adoption of policy discourses from center to periphery, but expecting to replicate one city’s success in another context may prove extremely hard. The motivations of the Basque political elite to attract a Guggenheim museum go beyond the potential (and we might add, limited) urban regeneration benefits of a building, and can only be understood within the political context of the Basque Country and its relations with Spain. The case of Bilbao’s revitalization has attracted significant attention as of late. This chapter uncovers the key issues surrounding Bilbao’s transformation and puts the process in the context of capitalist globalization and the formation of globalizing cities. The chapter questions the viability of revitalization schemes based on urban megaprojects. Applying some of the elements in the revitalization mix to most cities may be unavoidable due to rapid and acritical adoption of policy discourses from center to periphery, but expecting to replicate one city’s success in another context may prove extremely hard. Leslie Sklair is Professor Emeritus in Sociology at LSE. He received his PhD from LSE, and his thesis, Sociology of Progress, was published by Routledge in 1970 and was then translated into German. In 1973 he published Organized Knowledge: Sociological View of Science and Technology (which was translated into Spanish). In the 1980s he carried out field research on the developmental impacts of foreign investment in Ireland, Egypt and (more intensively) China and Mexico. He published Assembling for Development: the Maquila Industry in Mexico and the United States in 1989, with a second updated edition in 1993. These works provided the material basis for Sociology of the Global System (published 1991, second updated edition in 1995, translated into Portuguese, Spanish, Japanese, Persian and Korean). A third edition completely revised and updated, of this book, Globalization: capitalism and its alternatives, was published by OUP in 2002, and Portuguese, Arabic and Chinese translations are forthcoming. His book The Transnational Capitalist Class (2001) is now in Chinese. Professor Sklair was a consultant to the United Nations Centre on Transnational Corporations in New York (1987-88); the ILO in Geneva (1993); the US Congress, Office of Technology Assessment (1991); and the UN Economic Commission on Latin America in Mexico City (1992). He was a Visiting Research Fellow: at the Center for US-Mexican Studies, University of California, San Diego (1986-87; 1990); the Centre of Asian Studies, Hong Kong University (1994); and the School of Sociology, University of New South Wales, Sydney (1995). In addition, he held Visiting Professorships at the Department of Sociology in New York University (Spring 1993); and University of Hong Kong (1994). New School University in New York (2002) , University of Southern California (2004) and Strathclyde University (2005-2008). He has lectured at universities and at conferences in the UK, Europe, North, Central and South America, Egypt, China, Hong Kong, Korea, Australia and Jamaica. Professor Sklair is currently the President of the Global Studies Association and also on the International Advisory Board of the ESRC funded major project ‘Cities in Conflict,’ based at Cambridge University. Professor Sklair’s current research project, “Iconic architecture and capitalist globalization”, builds on his previous work on “Globalization and the FORTUNE Global 500”, which was partly based on interviews with major corporations around the world within a theoretical framework that recasts the relationship between global capitalism, classes, consumerism and the state. The architecture project focuses on how the transnational capitalist class uses iconic architecture. ourouHe is on the Editorial Advisory Boards of Review of International Political Economy, Social Forces, and Global Networks, and served as Vice-president (Sociology) of the Global Studies Association. Alén de empobrecer e despoboar a periferia, o modelo radial tende a crear un centro (véxase Madrid, París ou Londres) densamente poboado, suburbanizado e pouco integrador (o que podería derivar en falta de integración de colectivos en risco de exclusión social, véxase revoltas en París e Londres). É dicir, en realidade tampouco beneficia ao centro, só as grandes construtoras e determinadas élites, favorecendo así unha cada vez maior desiguadade social de base espacial. O problema é máis complexo e ten a ver co actual modelo de desenvolvemento capitalista. 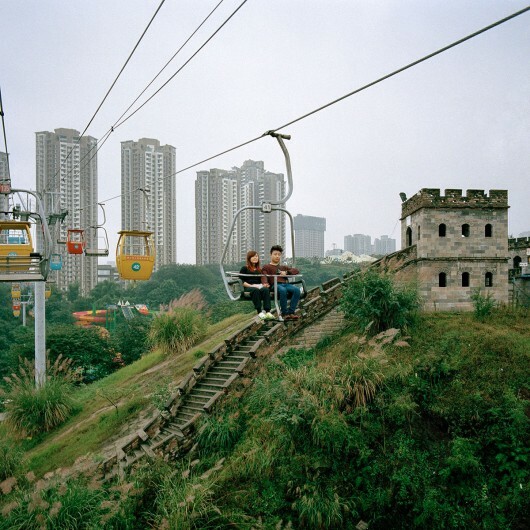 © Tim Franco These days, many of China‘s largest urban areas are easily recognizable to people from all over the world, with the skylines of coastal mega-cities such as Shanghai andBeijing taking their place in the global consciousness. Far less known though is the inland city of Chongqing – another of China’s five top-tier “National Central Cities” – where in 2010 the Chinese government embarked on a plan to urbanize a further 10 million of the region’s rural population, with around 1,300 people now moving into the city every day. 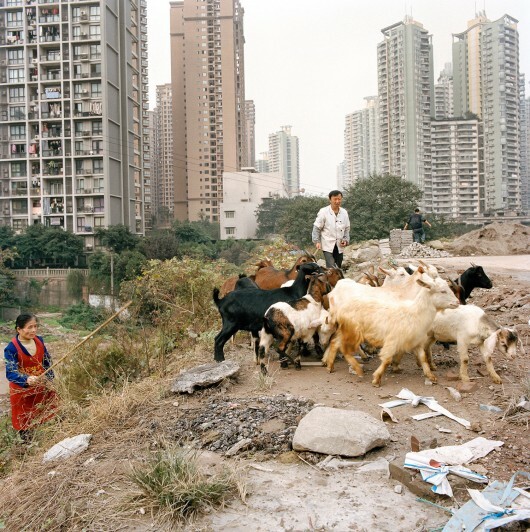 Since his first visit to the city in 2009 photographer Tim Franco has been on a mission to document the rapid change in what he believes is “maybe the most widely unknown megacity in the world.” The result is Metamorpolis, a forthcoming photographic book by Franco with text by British journalist Richard Macauley, which documents the colossal scale of development juxtaposed against the people of Chongqing – many of whom still live an incongruous rural lifestyle among the concrete sprawl. Read on after the break for more images from the book and an interview with Franco about the experience of documenting one of the world’s fastest-growing cities. You are European, and based in Shanghai. What made you choose Chongqing for this project, instead of other Chinese cities? Shanghai, Beijing, Hong Kong and many of Chinese coastal cities are very famous world wide; everybody has seen them and knows about them. They are the ones which were developed first when the economy boomed in China. I really wanted to witness the fast urban development of the country but I felt that in Shanghai, I was a bit too late – all the famous images of the city have circulated worldwide. That is why in 2009 I embarked on a small road trip to central China to visit some other secondary developing cities such as Wuhan, Chengdu and Chongqing. After a few days in Chongqing, I quickly understood it was the city I wanted to document. The most obvious reason is that this growing megalopolis is located right in between mountains and giant rivers, which give it a very unique scale. 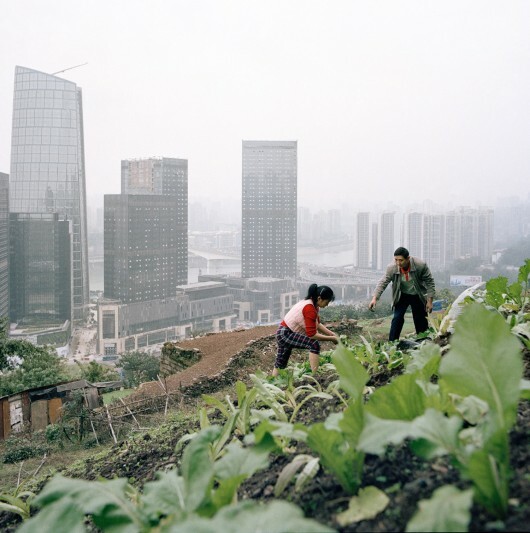 Most of the big cities in China are flat and extended but because of its unique geographical location, Chongqing is urbanizing through beautiful elements which gave the photos a very particular aesthetic. The second reason is that, being the latest province city to be created in China, and because of the different policies following the construction of the three gorges dam project, Chongqing was facing one of the fastest urbanization rates in the world. 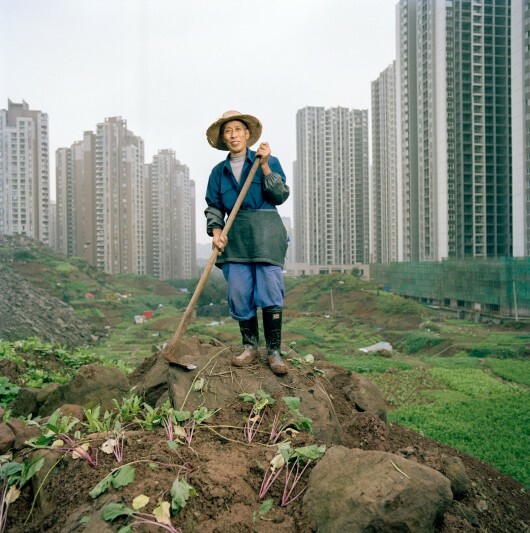 With almost two-thirds of Chongqing’s population still rural, the local government is trying to invert that trend and relocate a massive population of farmers into the city. I really felt that Chongqing was a representation of what was going on in the whole country, except in a rapid and city-scale simulation. What was your impression as a European when you first experienced Chongqing? My first week in Chongqing was thrilling! I felt like I was in Blade Runner, walking through dark alleys and getting lost in maze-like streets. Discovering different levels, taking elevators and cable cars to travel from one part of the city to the others. It looked to me like a chaotic and dark mix of Manhattan and Hong Kong. At that time, the local government was still chasing the giant mafia ring that controlled most of the city’s business for so many years: it felt like I was part of a movie! I couldn’t wait to go back there as soon as I left. It is kind of strange because the darkness and the mess of a city can be quite depressing and violent, but this also gives it a unique style and energy that made me want to photograph it even more. 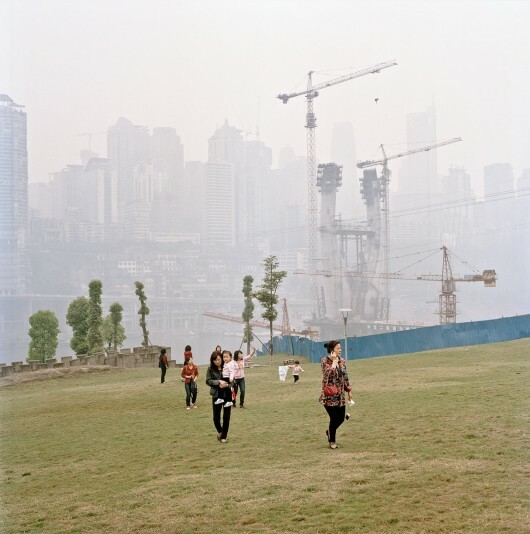 You’ve already been documenting Chongqing’s urban expansion for five years. Have you noticed any changes in how the city is expanding? The changes I have witnessed in Chonqqing are tremendous! I have seen entire districts disappearing in the center of the city. 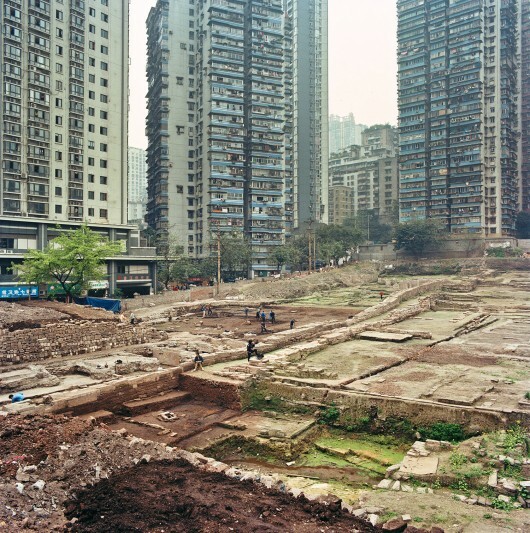 Some of the houses destroyed were witnesses to the Kuomintang era when Chongqing was the capital of China. I have seen farmlands on the North side of the city being taken over by concrete roads and housing complexes, with farmers continuing to plant vegetables between highways or on the side of construction sites. I basically witnessed the entire center of the city growing into highrise glass towers, and luxury shops appearing like mushrooms on the main pedestrian street. In 2009, I was struggling to find good coffee in the morning – now I can have one on the 58th floor of the Westin Hotel overlooking the city, shop at H&M and get my new iPhone in the fancy Apple store that just opened. It’s almost unbelievable. But it is also sad to see how the city is struggling with its originality, trying to copy other famous cities in the world, with a replica of Hong Kong IFC, a fake Zaha Hadid, or the new star project being build at the tip of the peninsula influenced by the Marina Bay Sands building in Singapore. 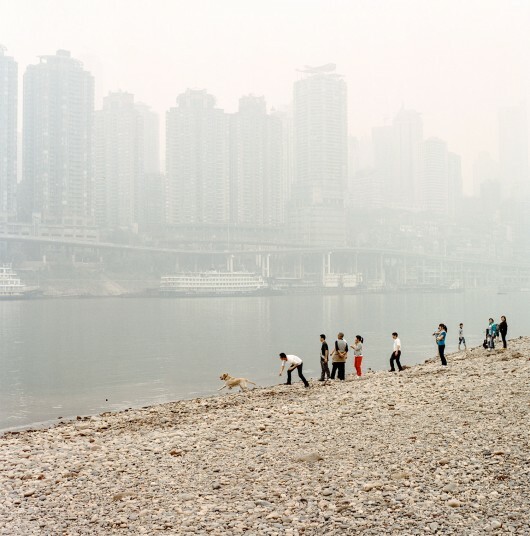 Do you think the people of Chongqing are adapting well to the city’s dramatic changes? This is a tough question and according to who you ask in the city, you may get many different answers. As a Westerner walking in the city you are very quickly shocked by the amount of traditional architecture and old buildings being destroyed, almost like erasing signs of the past. But when talking to the people who lived in very poor conditions in some of those buildings with little access to electricity or basic heating, you understand why they are welcoming the transition to high rise building. As ugly as they may look, they offer them a new level of comfort and a feeling of modernity. A feeling of becoming part of Chinese growth and not being left behind. But part of the population, especially people coming from the rural areas, are often struggling with the pace of urbanization. Often, the older generations don’t even know how to read or write. They find themselves moved to the city only knowing how to grow vegetables, so they start to find whatever land is available downtown to do the only thing they know how to do. To be very honest I am very impressed by how the people in China learn to adapt. It seems whatever happens and whatever the difficulty, they always find a way to adapt, create small business and communities. Even though the city is growing at an incredible speed, every part of the city seems active. One of the most striking things about your photographs is how you are able to simultaneously capture human-scale elements in the foreground with the huge buildings looming behind. Is there a particular camera setup you use for this or is it all about finding the right place to take a photo? I am glad you brought this up, because it was exactly what I tried to do in this project! I used to shoot a lot of urban landscapes prior to this project and I only found my photos interesting when I added a human element to them, to give them scale and to see how the space was actually being used. 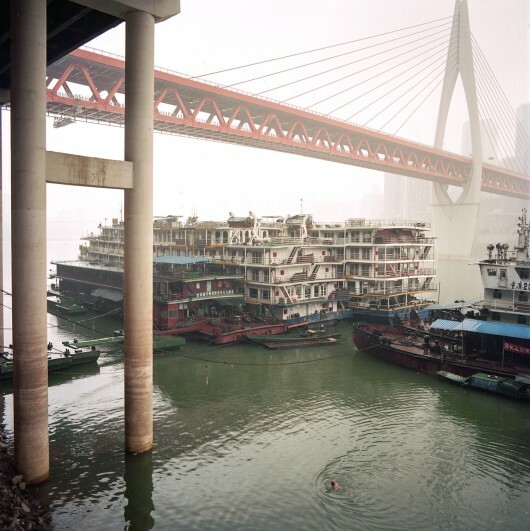 This process was important for me in documenting Chongqing. I really wanted to show how the city was growing out of proportion and to give a very visual idea of how enormous these constructions and buildings are. I don’t think there is a particular set up. I am using an old medium-format film camera, and I always try to spot the places with the city and the construction in the background and people in the foreground. This also allows me to be to invisible to the people I photographed so their action and behavior could be more natural in the photo. In general, I don’t like to force myself upon the people I photograph, so I either take a step back and photograph them in their environment or if I come closer, I engage them first in a conversation and explain to them what I am doing before taking a portrait. Do you have a favorite place in Chongqing to search for photo opportunities? I am not sure if I have a favorite place. The cable car running through the city (the one you can see on some of the photos and in particular on the video) is quite incredible because it takes you through the different layers of the city – actually, it used to do that, now half of those layers have been destroyed! In general, I am very attracted to every kind of place that gives you a sense of the scale of the city, with the rivers, the building, the mountains and the people. How do you search out new places in the city that could be interesting? These days, I rely on a network of people who are living in the city, both locals and foreign people that tell me about new places they discover. Often I also just find a place on the map I have never been to and take a taxi or a motorbike ride there. There is a good chance that on the way, I might find a new incredible place like a giant hole in the ground, some farmland in the middle of a construction site, or another architectural curiosity. For a while, I had a cheap motorbike which I purchased for about $200 USD and drove around the city and beyond. I sold it later for a little less. 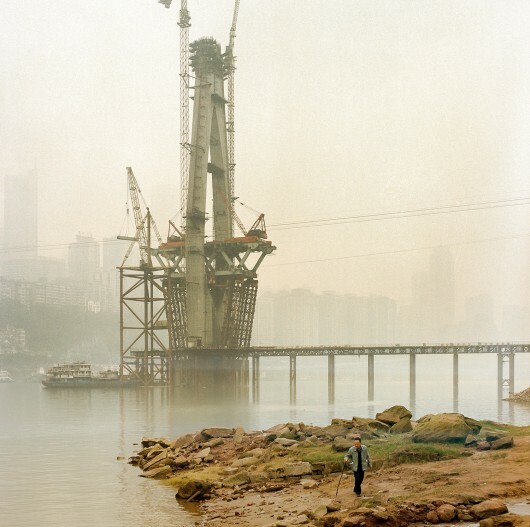 What do you think the future holds for Chongqing? 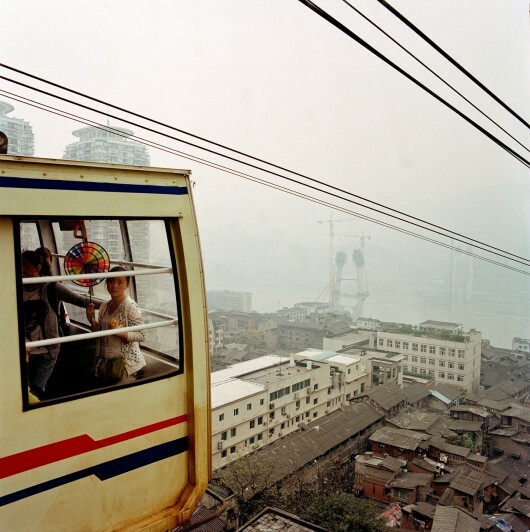 It is going to be interesting to look at the future of Chongqing. It is certainly becoming one of the biggest cities in China, and it’s facing a very big challenge in urbanizing a very large rural population. A lot of of other cities are looking at Chongqing to see how those urbanizing policies will work for the economic and social future of the city. For me personally, even if part of the process ends with the book being finalized, I will still continue to document the city as it grows.